An unspoilt country town, Oakham in Rutland is vibrant and modern with a busy restaurant scene but it also manages to retain a sense of tradition with its many beautiful architectural landmarks. On the outskirts of Oakham, by the edge of Rutland Water, is a grand old hall that is now a hotel and restaurant. Boasting a host of modern amenities, including a spa, Barnsdale Hall skilfully marries the grandeur of an older age with all the modern conveniences of the present day. Open for lunch and dinner, seven days a week, Barnsdale Hall Restaurant offers several dining options that are available to guests and the general public. Resplendent within breathtaking conservation parkland and well tended landscaping, the hall exudes timeless elegance and has the hushed echoes of a grand old hotel. Neutral decor that blends a light modern touch with a very traditional feel combines perfectly with the corniced ceilings that set the formal tone of the dining room; known as the Brasserie Restaurant, it is relaxing and peaceful whilst upholding exacting traditional standards. Billed as Modern British cuisine, the food at Barnsdale Hall Restaurant is actually more traditional British with the occasional introduction of European or Asian influences. The focus is on locally sourced seasonal ingredients with quality and freshness of paramount importance. Everything is reasonably priced, especially considering the quality of the ingredients and the skill involved in preparing them. Beautifully presented, with modern clean lines, the food here is stunning to look at and delicious to eat. The a la carte Brasserie menu reads well, with a selection of appetisers preceding the starters. With the spotlight on the ingredients and a varied choice of dishes, the starters include baked chicory stuffed with ham and ricotta, or a salad of fresh Dorset crab with potato and capers. For a truly simple classic you could go for a prawn cocktail served with brown bread and butter. The main courses offer various cuts of grilled steak with a choice of sauce, or traditional accompaniments that include hand-cut chunky chips, watercress and onion rings. There are classic but perfectly done roast meats, as well as fresh fish grilled to perfection. Alongside these traditional offerings some European ingredients make an appearance, such as polenta and parmesan, and for such a traditional menu there is a good deal of choice for non-meat eaters. The dessert menu has a list of 8 different cheeses and some accomplished British dishes including Pimm’s jelly. There is also a lunch menu with choices that differ from the a la carte and are all pleasing to the imagination. The bar menu consists of some light dishes and a few salads, alongside a range of quality sandwiches containing classic fillings and a few hot fillings such as rump steak with onions, or fish fingers with tartare sauce. Burgers and steaks make the usual appearance, but this food is of outstanding quality and excellent value; certainly a bar meal that is worth making a journey for. The restaurants in Rutland are of exceptional quality and the Barnsdale Hall Restaurant is certainly no exception. They have several money saving offers including a 3 course Sunday lunch for £15.95 or if you eat at lunchtime Monday to Saturday you can enjoy a 2 course set lunch for £12.50. 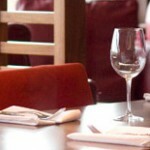 Booking through Go dine is free and easy and will secure your place at this popular venue. Why not browse the site to see what else we can offer and read our many reviews, menus and detailed descriptions of the best places to eat in the Midlands.